Print professional dual-sided cards with accurate color profiles and enhanced print qualities with the ID Maker® Advantage System. This all-in-one system comes with everything you need to start printing in 15 minutes, including the industry’s most user-friendly card creation software and the Advantage printer. Great for medium print volumes, the Advantage features a multi-card hopper and fast printing speed. It’s also compatible with upgrades like magnetic stripe and proximity card encoding. System includes: ID card printer, Logitech C920 HD web cam, mini tripod and white photo backdrop, 300 blank PVC plastic cards, 2 - 300-print YMCKO printer ribbons, and a printer cleaning kit. Prints full-color dual-sided ID cards. This is the first ID Badge Maker we have ever purchased. After doing extensive research, we found the ID Maker very affordable while producing a professional ID badge. Our customers see these badges everyday in all 37 of our quick oil change locations and have commented on how good they look. Instead of having our uniform company put names on the shirts, we can now display name, title, hire date and technical certifications. This is much more information presented to our customers in a clean, credit card sized ID badge. Our team members are proud to wear them, as it fosters a level of accomplishment as they complete training certifications. The "Getting Started Tutorial" needs work, though. An overview of how the system works would benefit those who want to accomplish creation of an ID badge that is not specific to the example in the "Getting Started Tutorial." We are just experimenting. I will let you know when we do this more officially. I use this product to create multiple forms of ID badges to be worn by my employees. The software is great. It is very simple and straight forward to use in creating your cards. The print quality of the ID maker is excellent. I have ran into a few problems where the ID would not print on both sides even when selected. This is a random occurance and Tech Support could not figure out the reason. I would suggest allowing the ID maker to be used in multiple computer ports without creating a new copy of the printer. Very good quality badges made very easily with simple, easy to follow templates. I have two small issues: 1. )The printer defaults to one sided printing every time I re-open the program. 2. )It would be good to lock locations of pictures in place so when you click on it to change for the next person's badge it doesn't move. Very pleased with the machine. Easy to use, prints quickly and very good images. Setting up this badge system was very easy. I did run into some issues with the quality of the printing on the badges, but the customer service department was extremely helpful. Their response time to my inquiry was very speedy, and we were able to get the problems fixed very quickly. The only issue we're having now is with the quality of the photos. The camera that comes with the machine is more of a webcam, so we will be purchasing the camera upgrade. The Advantage is a great ID printer. It is not perfect in it's print quality but it is pretty close. We went to this from paper ID badges and our employees look more professional than ever when visiting our clients. Setup is easy the only major flaw I had was with the webcam that came with it. I get better quality pictures from a digital camera but the webcam is good for chatting with friends and coworkers. We use this product at a Middle School for student ids. We print double sided so having a printer that could do that was a must. The printer was easy to setup, smaller in size than the previous printer, id software is easy to use, the camera was easy to setup, & the ribbon is a lot easier to install. The only downside was that the software cannot export pictures as of yet but after talking with tech support, it is something that will be added. The camera is made by Logitech so I was able to download the software from the Logitech website, we also use the pictures to update student pictures who are not here when school pictures are taken. Using our ID Maker to create employee badges. Were sending this job out. Extremely more efficient and important to have ID Maker in house that makes top quality badges the way we really want them. We decided to make the investment to make student and faculty id's. We are pleased with the quality of the id's and are happy to move forward with modern technology. We purchased this ID Maker just 3 weeks ago and use it daily. The set up was easy and the ID's we have made look exceptional. This Machine Does An Awesome Job...Creates Professional Quality Prints, And Does It Quickly Also! Already printed off 150 I D cards and it works great. 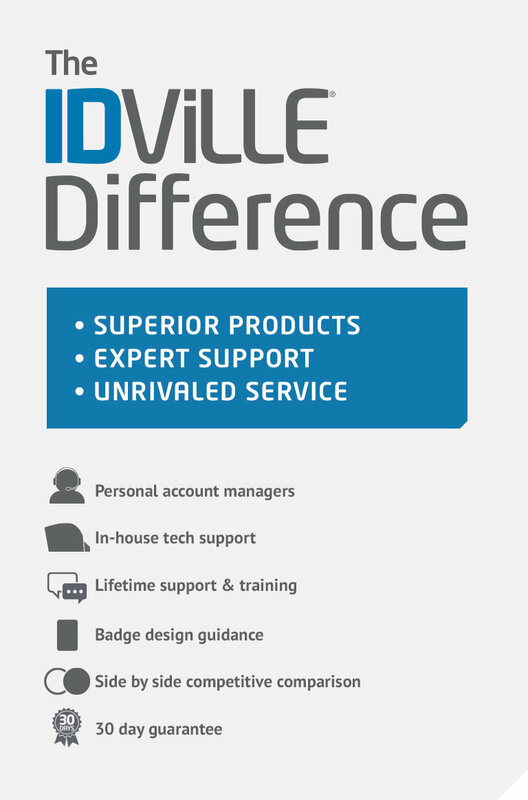 The ID Maker Advantage is a nice all inclusive package. The learning curve is very small and the quality of product is outstanding! We use it to produce both ID cards and to create response guides in card form for our employees. We bought this printer to print double and single sided cards for our employees. It is very user friendly and prints high quality cards. The ability to fully customize the cards to suit our needs was very nice. The only draw back is that you cant change the names on preset fields. Received our product quickly after ordering. Setup was easy and put out a good product. Highly recommend.